Who knew babies can leap BEFORE they can walk! Blogging about parenting and family life with horses and a child in tow! Did you know your baby can leap before they can walk? Before they can crawl in fact! I didn’t to begin with, but after seeing a few discussions on a Facebook due date page I am a part of I stumbled across an amazing app called ’The Wonder Weeks.’ And I’m saying it now, for probably the thousandth time, I freaking love it! My job title is Nursery Practitioner, I’m not qualified but I fell in to a job position in a nursery nearly 5 years ago and I fell in love with it! Now if you ask anyone who knows me and has known me since I left school they would of laughed if someone had said to them that I would of ended up working in Childcare, in fact I would of cried with laughter myself if someone had said it to me, but I LOVE it. One of the crucial and most important parts of this job is knowing the EYFS (Early Years Foundation Stages) off by heart. It’s basis is Learning Through Play. This ‘bible’ is how we help your little ones develop and learn in the first stages of their life. But one thing I always wondered was, although it starts at 0-11 months, why there wasn’t as much information on developmental milestones for that age range. 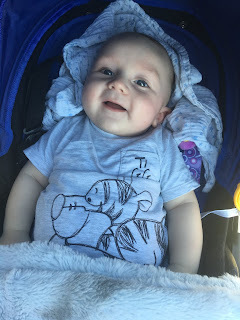 So when my little boy arrived I wondered ‘what can I do to help him develop?’ ‘How can I, as his mum and someone who strives to give children the best chance at developing in every area, help him explore this whole new world he’s arrived into?’ Well this is where this clever little app comes in! Now I’d just like to make it clear that I’m not working with them to market their app, or book, they have a book which i’m intending on buying and reading, I just adore this app and it has helped me massively, especially being a first time parent. I had no idea what I was doing (lets be honest who does with your first child?) so this app has really helped me on slightly stressful days when I felt like I didn’t know what my little one wanted despite trying everything. You enter in the date that your little one is or was due and it works out when your baby will go through a growth spurt, also known as a Leap in his or her neurodevelopment. And believe it or not the first one happens at just 5 weeks after their due date! It gives you a condensed run down of what your baby is going to experience when going through each leap, what change in their behaviour you can expect, what they will of learnt by the end of the leap and, the best bit, how YOU can help them through it! You even get a chart that will show you when to expect the next leap, which is labelled with a storm cloud. Now my little one one is nearly 4 months old and is currently going through Leap 4 and boy is this one a long one! About a month long! It’s told me how his behaviour will change, which has been spot on, and how I can help. So for the last couple of days I noticed that instead of my independant, happy and easy going little boy I have had a very cuddly, reserved baby who Ian craving as much attention as possible and going through some mood swings that are like the ones us woman are famous for! So off I go to my trusty app and low and behold he’s on his leap! So off I got to the help section. What can I do to help him understand this new part of the world he is exploring and learning about? In this Leap BB is learning about how to perceive and control everything around him. One thing that I learnt that can help him through this is ensuring that he has lots to observe and feel and touch. So I pimped his rocker! I bought a few more colourful and noisy toys and his rocker now has lots of things he can hear, see and feel. And I am telling you now that is THE BEST thing I have done so far. He is so content in it! I can actually put him down in order to get all the boring house stuff done! If you are a first time mum, actually even if you’re not, I urge you to download this! I think it costs £1-2 but it’s been a life saver. When I have felt like pulling my hair out and rocking in a corner crying because I don’t know what I’m doing wrong this app has reminded me that my little one is basically feeling the same. My little monkey is going through lots of brain changes and he doesn’t understand everything he’s feeling, it reminds me that he just needs his Mummy to help him through it and show him that it’s okay. It’s a tough job being a mum and this is one of those things that I highly recommend to have on standby. Just like you need bottles and nappies and wipes, The Wonder Weeks has seriously become my personal ‘Bible‘! The Wonder Weeks App - The Chart of Leaps. The rocker that saved my sanity! How I realised my worth. Hey! I'm Lauren, otherwise known as Country Mumming. I am 25 and a Type 1 Diabetic, I have one little monkey called Albert who has Cystic Fibrosis, two horses called Cromwell and Bourbon (after the biscuit). My partner is Adam (who you might of heard on the Radio on Heart Wilts and is soon off to BBC Oxford!) I love anything horsey and love to get my nose in to a good book (when it's not in Facebook of course)!